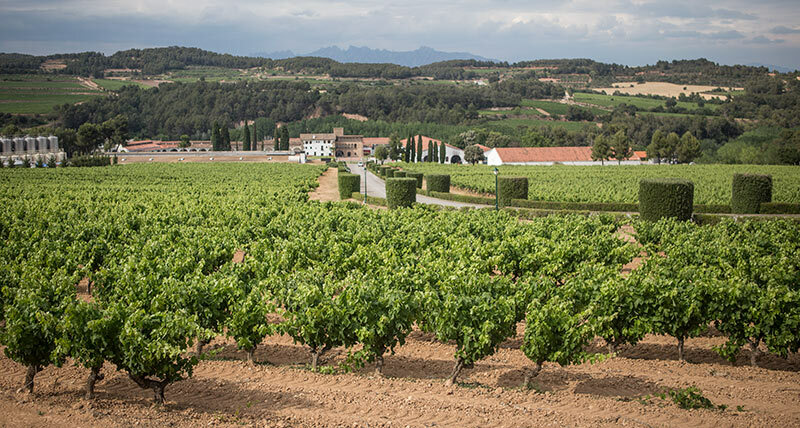 A logical starting point in any article about Catalan white wines is DO Penedès. They are by far the largest wine producing region in Catalonia and 80% of what they produce is in the form of white wine. While seen as something of a go-to reference when you wanted an innocuous white wine for a meal, the last 8-10 years has seen a massive change in their approach and the rise of both smaller producers as well as the larger ones making more craft wines. One of the most important changes is that they’ve made a huge effort to “own” the grape, Xarel·lo and in the process, they’ve put forth the punt volat, a character no English language publication can ever correctly write, but more importantly, they’ve created some fine, fine wines with a nearly unparalleled aging ability. Following are the wines tasted for this report in Decanter that met the minimum cutoff of 85 points. Note that I could have easily tasted 10 times more than these but they needed to be available for sale in the UK and I also requested more “notable” wines which I can only assume is why there’s such a wonderful dominance of Xarel·lo. Starbright lemon. Creamy melon, light, delicate apple blossoms, mature pear, and many layers of texture. Beautiful in the mouth with excellent and integrated acidity and citric notes that flows into a lingering, long finish in the mouth. Lemon, starbright. Apricot, white peach, creaminess, as well as light floral notes. Light and succulent in the body, very lovely balance and interplay of acidity and structure that don’t overwhelm each other. Lingering floral finish. Bright lemon, greenish tinge. Grapefruit and green apple, good chalky mineraly component, and a touch of bitter melon. Very even and balanced in the mouth despite the bit more than medium acidity. Tasty and lively with a lengthy finish. Bright lemon. Melon, white pear, crisp mintiness, light yellow blossoms. Crisp and lively in the mouth, more pear comes up as well as strong, yet balanced acidity and a clean, savory finish. Pale lemon. Lemon pith, yellow peach, sweet spices, white pepper, and apricot as well as minor red apple. Crisp and citric in the mouth with red apple notes more prevalent, good persistence and acidity. Bright lemon. Ripe white peach, lemon citrus, bit of crisp apple, chalky minerality. Lively and quite pleasing in the mouth. medium plus acidity and a good intensity to the body that carries the wine through to a lingering finish. Starbright lemon. White blossoms, light crisp melon, very linear and subtle, light floral notes of white blossoms. Full in the mouth, more redolent with tropical notes, pineapple comes forward along with crisp green apple and a long finish. Bright lemon. Lemon pith, bitter melon, light honey, white pear, herbal notes. Crisp, taught, and succulent in the mouth with medium plus acidity and a medium finish. Vineyard from 1960. Pale lemon. Lemon peel, grapefruit, light orchard blossoms. Crisp, fresh and juicy in the mouth, persistent in the finish with good intensity. Pale lemon. White peach and pear, bit of melon as well, white pepper, light mineral notes. Good, medium plus acidity, lime peel, and green cherry in the mouth, medium finish. Bright lemon. Crisp green fruits, fennel, licorice, strident minerality at the base. Crisp with apple notes, medium acidity, bit of bready yeast to it as well that lingers in to the finish. Even and well-made but more for the natural crowd. Starbright lemon. Touch of reduction before revealing lemon pith, Asian pear, lily, and orange blossom. Fresh and integrated in the mouth, medium plus alcohol, good body with citric grapefruit notes trailing in to the finish. Starbright lemon. Lemon peel, muted blossom notes, smooth chalk, bit of green herbs, watercress. Fresh lemon citrus, medium plus acidity, crisp, lively, medium finish. Bright straw, green pear, wild herbs, rosemary, bit of sandalwood. Medium across the board in the palate with with a peppery, crisp finish. Lemon. Bit of reduction on top of grapefruit and lemon pith, light white blossoms. Melon notes much more prevalent in the mouth, savory, full, quite luscious. Lemon, citric peel, grapefruit, light mineral notes, with white pear. Lemon peel in the mouth, generally fresh with medium acidity although a short finish. Bright lemon. Apple blossom, light lemon peel, crunchy, rocky mineral note so chalk. Fresh in the mouth with medium plus acidity although lacking much in intensity and a medium short finish. Lemon. Light white peach, lemon pith, crisp green herbs. Crisp and linear in the mouth, medium plus acidity, medium finish with sticky bitter melon notes. Bright lemon. Muted apple blossoms and fruit. Grapefruit citrics from the barrel fermentation. Full and fruity with green fruit notes on the palate. Medium acidity and finish. Straw. Lemon pith, light pineapple and guava, mineral notes, generally quite subdued. Even and balanced across the palate, nervy and alive. Medium minus acidity and finish. residual CO2, bright pale lemon, immediately grapey, gooseberry, and minor crisp green apple. Fresh in the mouth and dominated by the apple notes, boundlessly high acidity although an empty finish. Bright lemon green. Lemon and lime citrics, crisp, young green apple, hint of mulberry. Crisp and fruity in the mouth, juicy peach notes come out more. Medium intensity, acidity, and finish. Lemon. Lightly bruised green apple notes, crisp pear, herbal notes of mint, rosemary. Lacking intensity in the mouth, medium acidity and a short finish. Bright lemon. Light white peach and blunted apple blossoms, white pear, and boundless chalky notes. Medium acidity in the body, fresh and light, not a great deal of persistence but generally pleasing. I’m not sure if you’re referring to the Chardonnay listed here or another, but this one here (at least this bottle) didn’t show amazingly well. Not a bad wine at all, but just generally average in terms of the overall scope of the region. I’m always happy to re-taste of course in case it was just an issue with the one bottle I received.